SEO is key. Lead conversion vital but weak. How do you compare to current trends identified in HubSpot’s 2016 Inbound Report? Among all respondents, 73% said inbound was their primary approach to marketing. For subjectivity, only 15% were HubSpot customers or agency partners. This and subsequent blogs will describe the report’s key revelations. This chapter covers today’s Inbound Marketing and Sales Priorities. Priorities have shifted from previous years to converting website, social media, video, or blog visitors into strong leads and good customers. Not long ago, the first priority was simply growing traffic to these diverse channels. Now, online selling and customer retention is ‘job one’ for inbound marketing, due in large part to recently introduced inbound measurement tools to track/measure data points linking sales back to digital channels. Better and more widespread use of marketing automation tools has shifted priorities from ‘getting them here’ to ‘making them buyers’. Growing website and other digital traffic has now become the second most important priority, followed by upselling existing customers regardless of their point of contact. Another interesting find is the rank-ordering of marketing activities considered most critical to successful inbound marketing. 60% of respondents said improved search engine optimization (SEO) is now the most important inbound marketing activity. It also includes preparing various short; longtail keywords for use in web landing pages; titles; blog copy; product descriptions; other references to attract/retain visitors doing searches. The next most important? At 60%, it’s (surprise!) blog generation and content keyed to the above elements. Blogging is now the marketer’s ‘bread and butter’. 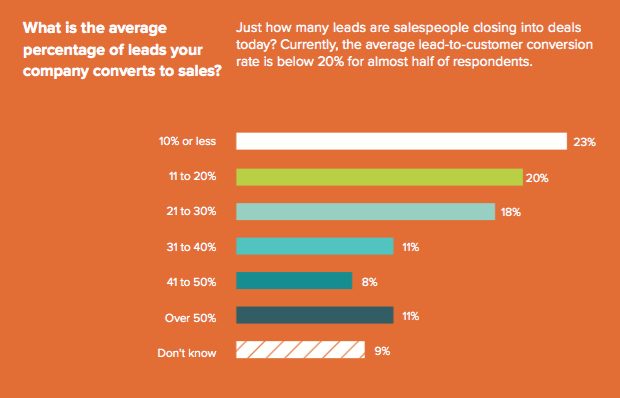 As mentioned, inbound marketing’s newest challenge is growing lead-to-sales conversion rates. So far, almost half the survey respondents currently put it at just below 20%. And nearly 10% reported not even knowing their lead conversion rate, or cannot now track it. There’s much work to do here. Finally, social selling grew slightly at 4% from last year, defined as developing personal relationships as part of sales.This includes customer outreach or interaction from postings on multiple social network channels, blogs and the sales that result. Would you like more information about HubSpot’s 2016 State of Inbound report, including other key findings and a discussion of their ramifications? Contact Anne-Mie Vansteelant at +32 55 591 007 or anne-mie.vansteelant@livingstone.eu for a no obligation conversation.